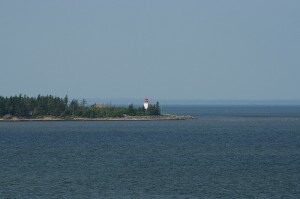 The provincial park of Caribou-Munroes Island is the perfect place to unwind after a busy morning of sightseeing in Pictou or as you wait for the ferry to Prince Edward Island. There’s warm swimming in the Northumberland Strait and a two-kilometer walk along the sand will bring you to Munroes Island. It was once independent of the mainland but sand drifted in to fill the channel once it stopped being used by local lobster fishermen. On Munroes Island, you can stroll through forests of beech, white spruce and maple and watch for seals basking on the shore. You might also spot a red fox darting between the trees or see a bald eagle soaring overhead. One type of wildlife you won’t care to see will be jellyfish. Keep an eye out for them when you’re swimming, although even if you are stung the worst that should happen is a little stinging and redness on the skin. If you want to spend the night, there are 95 campsites in the provincial park as well as bathrooms and showers. Directions: The park is about 6km north of Pictou. To get there, take Exit 22 off Highway 104 and then follow Highway 106 to Pictou. The park is 4km east of the terminal for ferries to Prince Edward Island. Open: From mid-June to mid-October.